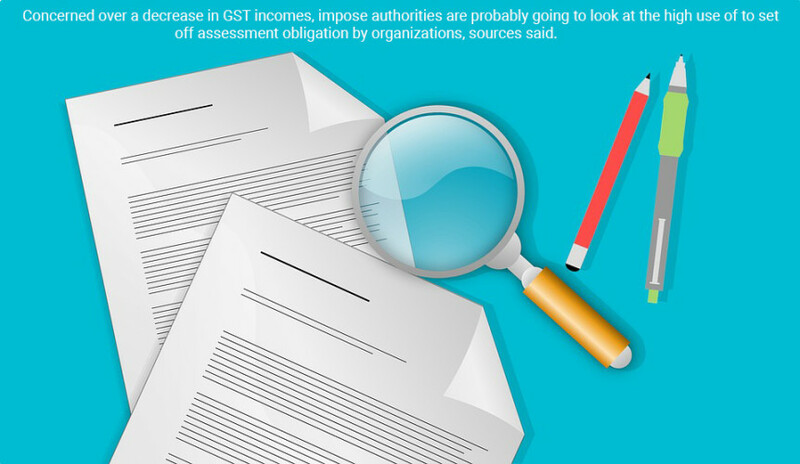 NEW DELHI: Concerned over a decrease in GST incomes, impose authorities are probably going to look at the high use of to set off assessment obligation by organizations, sources said. The issue of high ITC was hailed at the gathering of the Group of Ministers (GoM) which was set up by the GST Council to investigate the explanations behind income setback being looked by countless. As indicated by sources, benefiting ITC preferably ought not result in loss of income but rather there could be plausibility of abuse of the arrangement by corrupt organizations by creating counterfeit solicitations just to guarantee charge credit. Amid the gathering of the GoM, it was brought up that as much as 80 percent of the absolute GST risk is being settled by ITC and just 20 percent is saved as money. GST income has found the middle value of around Rs 96,000 crore for every month so far this monetary and this mirrors the money part being saved by organizations. Under the present administration, there is no arrangement for continuous coordinating of ITC claims with the charges officially paid by providers of sources of info. The coordinating is done based on framework produced GSTR-2A, after the credit has been guaranteed. In view of the befuddle featured by GSTR-2A and ITC claims, the income division sends notification to organizations. "As of now there is a period hole between ITC guarantee and coordinating them with the charges paid by providers. Subsequently there is a probability of ITC being guaranteed based on phony solicitations," a source said. When the new return recording framework winds up operational, it would end up feasible for the division to coordinate the ITC asserts and assesses paid consistently. The income division would now examine the extensive number of ITC cases to see whether they are certifiable or dependent on phony solicitations and make remedial move, sources said. GST accumulation remained at Rs 1.03 lakh crore in April, Rs 94,016 crore in May, Rs 95,610 crore in June, Rs 96,483 crore in July, Rs 93,960 crore in August, Rs 94,442 crore in September, Rs 1,00,710 crore in October, Rs 97,637 crore in November and Rs 94,726 crore in December 2018.